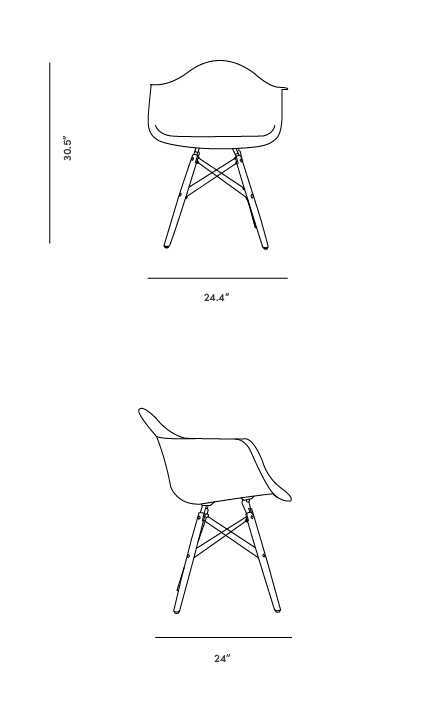 The welded Eiffel base and organically shaped polypropylene plastic shell were completely new structural forms in the industry when they were designed, resulting in one of the first industrially manufactured plastic chairs of the mid-century modern era. The now iconic design includes a high flexible back, deep seat, and waterfall edge. This variation of the classic armchair features solid wood legs with high grade stainless steel hardware. Chair looks great but the plastic seat material feels slightly more plasticky than I had anticipated. I also ordered the DSW molded plastic side chair in white with these - the plastic seat of the DAW has a different texture than those (slightly more dimpled/rough, not as smooth). Assembly was finicky but not difficult. Chair legs also expand out a little when you sit in them, so I feel like I should get a rug to make sure the chair legs don't scratch up the hardwood floors. Love the chair! Very comfortable and easy to clean. Easy set up as well. easy to put together. comfy chair. Great chairs! I can't wait to get them in a couple of weeks. Shipping was a bit expensive. Would have liked free shipping. Easy to assemble and great looking.